Born: 21 November 1858, Bloemfontein, South Africa. Died: 25 April 1930, Bloemfontein, South Africa. Gustav Baumann was a member of a Jewish family with a German background. He received his schooling at Grey College in Bloemfontein from 1869, showing an early aptitude for mathematics. After passing the highest class taught there by Dr Brill* he was sent to the South African College in Cape Town where he studied during 1876 and 1877. However, the effects of a head injury sustained in an earlier horse riding accident ended his studies. After six months as acting private secretary to President Brand and another six months as acting assistant postmaster he went overseas for medical treatment, consulting specialists in England and Germany. At the end of 1878 he became apprenticed to the Surveyor-General of the Orange Free State, George F. Stegmann*. The next year he passed the examination for the certificate of proficiency in the theory of land surveying of the University of the Cape of Good Hope and spent the year doing practical field work with surveyor Klaas Vos of Smithfield. He made his trial survey on 1 January 1880 and qualified as a land surveyor. He then joined Stegman, who had resigned as surveyor-general, as a junior partner. After two years he again visited Germany for treatment of his head injury, returning in November 1882. After Stegmann's death he continued practising on his own, first in Heilbron and later in Windhoek, his work consisting mainly of settling disputes over property boundaries. When extending the survey of Bloemfontein he applied the latest principles of town planning and thus greatly facilitated later extensions. In 1897 the then Surveyor-General of the Orange Free State, J.C. Fleck*, became ill and Bauman occupied the post in an acting capacity. After Fleck's death he was appointed permanently in 1898. He had more progressive ideas than his predecessors and completed the system of deeds registration and the proper survey of all Free State farms. However, his plans to produce a topocadastral map of the territory were interupted by the outbreak of the Anglo-Boer War (1899-1902). After handing over his deeds when the British occupied Bloemfontein he refused to work for the occupying force and was sent to Cape Town. Here his friend, surveyor E.H.V. Melville*, introduced him to photography. Joining his family in Ladybrand during the rest of the war he earned a meagre living as a photographer. His personal papers and surveying instruments, which he had left in Bloemfontein, were destroyed or stolen. Nonetheless he set up practice again in Bloemfontein after the war, until his retirement in 1918. In 1914 and 1915 he was a member of the Board of Examiners of the annual surveyors' examination of the Orange Free State. 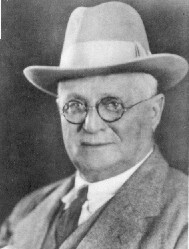 He retained an active interest in the profession after his retirement, serving as president of the Institute of Land Surveyours of the Orange Free State from 1924 or earlier, to at least 1927. He also devoted himself to the problems of soil erosion and water conservation, which had been life-long concerns. Though a forceful character, he was a cheerful optimist and well-known raconteur. Baumann's book The practice of land surveying in the Orange River Colony was published in Bloemfontein in 1905. He published articles on surveying in the Free State in the early days in the Journal of the Institute of Land Surveyors of the Transvaal (1919) and the South African Survey Journal (1925), as well as a pamphlet Titles to farms. The history in the Orange River Colony, sometime before 1910. His memoires were published by his daughter, Elfrieda Bright, in 1940 as The lost republic; the biography of a land surveyor. He served on the management committee of the National Museum of the Orange River Colony from 1904 to 1910. In 1911 he was a member of the South African Association for the Advancement of Science. He married Penelope G.T. Bagley in March 1887. Baumann, G. Early survey in the Orange Free State. South African Survey Journal, 1925, Vol. 1, pp. 309-312. Baumann, G. & Bright, E. The lost republic: The biography of a land-surveyor. London: Faber & Faber, 1940. Coetzer, A.C.M. Geskiedenis van die Nasionale Museum, 1877-1911. Navorsinge van die Nasionale Museum, 1989, Vol. 6, No. 8, pp.243-291. Liebenberg, E.C. Die topografiese kartering van Suid-Afrika, 1879-1972, 'n histories-geografiese ontleding (p. 139, 419, 422). MA-verhandeling in Geografie, Universiteit van Suid-Afrika, 1973. National Automated Archival Information Retrieval System (NAAIRS). http://www.national.archives.gov.za/naairs.htm Documents relating to Gustav Baumann / G. Baumann. Obituary. South African Survey Journal, 1930, Vol. 7, pp. 269-274. Ritchie, W. The history of the South African College, 1829-1918 (Vol. 2, list of alumni). Cape Town: T. Maskew Miller, 1918. South African Association for the Advancement of Science. Report, 1910, list of members. South African Survey Journal, 1924-1927, Vol. 1-2, The Institutes of Land Surveyors. University of the Cape of Good Hope. Calendar, 1884-1885.